High quality, commercial grade microphone and small-signal cable that's perfect for building your own! Also for making high quality low noise RCA patch cables. Features two 22 ga. center conductors (as opposed to 24 ga. found in many competitors' cables) for lower resistance and maximum signal transfer. Super durable, yet flexible midnight blue PVC outer jacket. Available in custom lengths, or buy it on spools and save. Specifications: * Conductors: 2 x 22 ga. (65 x 40 ga.) * Insulation colors: Black and white * Shield: 92% coverage bare copper braid * Jacket: Midnight blue PVC, 6.4 mm (.252") O.D. * 100% satisfaction guaranteed * Made in the U.S.A. The compact design offers the shortest XLR cable version in the industry. 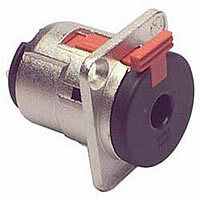 A more economical version of the standard "X" series connectors, the X-1 series has a one-piece plastic boot. The female features an insert that's completely surrounded by metal for added protection and the shell has a rubber ring for secure mating to a male XLR or microphone. Assembly is quick and easy with no screws to worry about and includes the unique Neutrik chuck type strain relief. 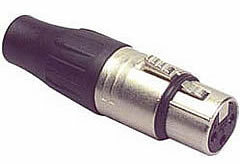 Connector type: XLR female. Shell: Nickel. Contacts: Silver. Mfg. #NC3FX-1. Neutrik's X Series has become the accepted worldwide standard for XLR cable connectors. The compact design offers the shortest XLR cable version in the industry. Assembly is quick and easy with no screws to worry about and includes the unique Neutrik chuck type strain relief. 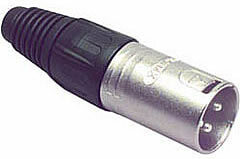 Connector type: XLR male. Shell: Nickel. Contacts: Silver. Mfg. #NC3MX. Pro Sound connectors offer superb build quality, fit and finish at an incredible price! 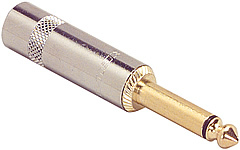 Features heavy-duty gold plated brass construction for performance and durability, thick gauge shell for superior shielding, and heavy gauge solder points and grounding tab with an aggressive cable clamp (unlike the thin, flimsy tabs and clamps you'd typically find on a connector in this price range.) Includes plastic insulator sleeve. Sold individually. All NYS Series 1/4" commercial plugs feature machined brass construction with nickel plating, a largerhanypical cable clamp and solder tabs. Short handle versions have a 35.5 mm long barrel, 65.5 mm overall length. Long handle versions have a 43.0 mm barrel, 73.0 mm overall length. 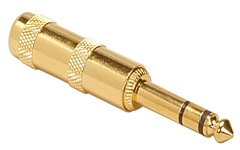 Connector type: 1/4" Mono, long handle with gold plated plug . Mfg. #NYS 224G.